"Freshwater wetlands" means freshwater swamps, marshes, bogs and similar areas that are inundated or saturated by surface or groundwater at a frequency and for a duration sufficient to support, and which under normal circumstances do support, a prevalence of wetland vegetation typically adapted for life in saturated soils; and, not considered part of a great pond, coastal wetland, river stream or brook. 38 MRSA 480-B(4). "Coastal wetlands"means all tidal and subtidal lands; all areas with vegetation present that is tolerant of salt water and occurs primarily in a salt water or estuarine habitat; and any swamp, marsh, bog, beach, flat or other contiguous lowland that is subject to tidal action during the highest tide level for the year in which an activity is proposed as identified in tide tables published by NOAA's National Ocean Service. 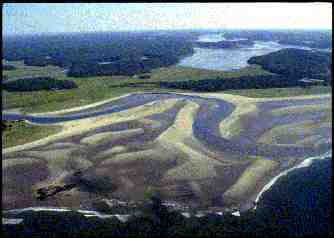 Coastal wetlands may include portions of coastal sand dunes. Tiner, Ralph W. June 1991. Maine Wetlands and Their Boundaries: A Guide For Code Enforcement Officers. Prepared for the State of Maine Department of Economic and Community Development Office of Comprehensive Planning, Augusta, ME. Tiner, Ralph W. 2005. In Search of Swampland: A Wetland Sourcebook and Field Guide. Rutgers University Press, Piscataway, NJ. Second edition. Gawler, S. and A. Cutko. 2010. Natural Landscapes of Maine: A guide to Natural Communities and Ecosystems. Maine Natural Areas Program, Maine Department of Conservation, Augusta, ME. Coastal marshes are "grasslands" periodically flooded by tides, primarily salt or brackish tidal water. These marshes are flooded by the tides at various intervals, ranging from once daily to a few times a year. When not flooded, however, the soils remain saturated near the surface at least during the high tide stage. The salinity due to ocean-derived salts creates a salt-stressed aquatic environment that prevents the establishment of most wetland plants. Plants adapted for life in salt water are called "halophytes." Most halophytes actually grow best in fresh water, but are outcompeted by other plants there and forced to live in salt and brackish environments. In more saline areas, coastal marshes called salt marsh are represented by grasses and grasslike plant: smooth cordgrass, salt hay cordgrass, salt grass, salt marsh bulrush, glasswort, black grass, baltic rush, salt marsh sedge, and seaside arrow-grass. Further landward or upstream, brackish marshes dominated by narrow-leaved cattail are found. Seaside goldenrod, prairie cordgrass, and common reed also occur in these situations and along the upper borders of salt marshes. The most upstream coastal marshes are freshwater tidal marshes. They are strictly freshwater wetlands whose water levels fluctuate due to tidal action. Wild rice, cattails, and other freshwater species dominate these tidal marshes, such as those found in Merrymeeting Bay. Tidal marshes provide vital habitat for clams, crabs, and juvenile fish, as well as providing shelter and nesting sites for migratory waterfowl. Floodplain forested wetlands are temporarily flooded forested wetlands found along major rivers and streams. They are often dominated by silver maple, green ash, and American elm. Bur Oak is locally common in central Maine. Ostrich fern is usually the characteristic herb, along with sensitive fern, jewelweed, and false nettle. The northern waterthrush, barred owl, belted kingfisher, bank swallow, and green heron are associates of this community. Rare turtles like wood turtles overwinter in river channels and forage in floodplain forests. Types that occur in Maine include upper floodplain hardwood forest, silver maple floodplain forest, and balsam poplar floodplain forest. 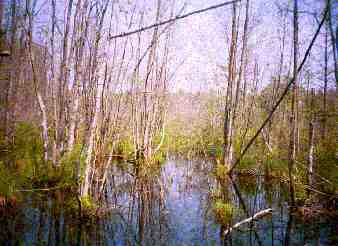 Deciduous forested swamps are characterized by deciduous trees (20 feet or taller). They are mostly seasonally flooded wetlands along rivers and streams or in isolated depressions. Dominant swamp trees include red maple, larch, black ash, yellow birch, gray birch, green ash, and American elm. White pine may also occur in varying abundance. Black willow and rarely, black gum may be dominant in southern Maine. Associated shrubs include highbush blueberry, sheep laurel, maleberry, black chokeberry, mountain holly, common elderberry, common winterberry, and silky dogwood. Herbs include skunk cabbage, Jack-in-the-pulpit, Canada mayflower, royal fern, cinnamon fern, sensitive fern, and marsh fern. A wide range of birds make their homes in these wetlands and many types are good habitat for rare turtles like wood turtles. Types that occur in Maine include red maple swamp, pocket swamps, hardwood seepage swamp, and black ash swamp. Evergreen forested swamps are dominated by needle-leaved or scale-leaved evergreens growing on hydric mineral soils or shallow peats. Northern white cedar is one dominant type which may be mixed with red maple, hemlock, balsam fir, larch, and black spruce. Understory species include rhodra, royal fern, sensitive fern, goldthread, northern arrowwood, Canada mayflower, and jewelweed. Black spruce and larch are often co-dominants in forested bogs. Associated species are ericaceous shrubs, cotten-grasses, cranberries, bunchberry, speckled alder, and various sedges. Peat mosses form the ground cover and three-seeded sedge may also be common. In southern Maine, Atlantic white cedar may predominate along with other bog shrubs. Hemlock is another dominant evergreen forested wetland type. Associated plants may include red maple, white pine, yellow birch, Canada mayflower, and goldthread. White pine also may dominate some evergreen forested wetlands. These forests provide habitat for many coniferous forest specialist bird species and may be used by deer as wintering areas. Other mammals like the American pine marten and Canada lynx may also be found in far northern areas. Types that are found in Maine include spruce-fir wet flats, northern white cedar swamps, evergreen seepage forests, and atlantic white cedar swamps. Inland Marshes are nontidal wetlands usually dominated by grasses or grasslike plants. They are seasonally flooded and usually saturated at or near the surface when not flooded. Dominant plants include broad-leaved cattail, tussock sedge, wool grass, bluejoint, reed canary grass, manna grasses, rice cutgrass, three-way sedge, soft-stemmed bulrush, hard-stemmed bulrush, common three-square, pickerelweed, big-leaved arrowhead, giant bur-reed, wild rice, white water lily, horsetails, and beggars-ticks. Lily pads, reeds and bulrushes provide habitat for red-wing black birds, great blue herons, otters, and muskrats. Many species, including wood ducks, muskrat, and swamp rose will only be found in inland marshes. Other common species found here are loons, snapping and painted turtles, woodpeckers, warblers and other songbirds, osprey, marsh wren, and many types of dragonflies and damselflies. Wet meadows are seasonally flooded for varying periods or saturated near the surface due to local high water tables. 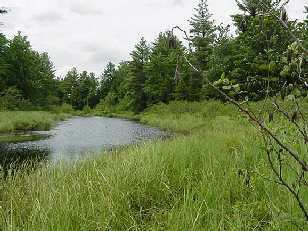 Some wet meadows occur along streams and lakes, while others develop in depressions or river valleys maintained as open land by human intervention. They can be dominated by a single species or characterized by a diverse assemblage of plants. Sedges (commonly lurid sedge), sweet flag, and soft rush are chief dominants along with various grasses including reed canary grass, blue-joint, and bent grass. Other typical wet meadow plants include skunk cabbage, angelica, marsh fern, and sensitive fern. Shrubs that can occur in wet meadows include silky dogwood, arrowwoods, steeplebush, broad-leaved meadowsweet, and narrow-leaved meadowsweet. In typically “drier” wet meadows, blackberry and multiflora rose may also be present. Many types of birds use these meadows for nesting and foraging, while some wet meadows function as vernal pools which are vital breeding grounds for many amphibians like wood frogs, spotted salamanders, and blue spotted salamanders. Types that occur in Maine include tall grass meadows and sedge meadows. Fens are variably mineral-rich peatlands developed in areas of groundwater discharge and along rivers and streams. There are three different types: rich fens, medium fens, and poor fens. They are differentiated by soil chemistry and vegetation. The availability of minerals in rich fens creates opportunities for many wetland plants to grow. Larch and northern white ceder dominate wooded fens with red maple, black spruce, black chokeberry, sweet gale, blue flag, skunk cabbage, and rarely bog birch also present. Herbaceous fens are dominated by sedges, cottongrasses, white beak-rush, peat mosses, and liverworts. The Showy ladyslipper (Cypripedium reginae) is a unique plant that thrives in fens. Many types of songbirds and aquatic insects make their homes in fens, with some like the Clayton’s Copper Butterfly restricted to one type of fen (circumneutral) and only found in 14 sites worldwide (9 being in Maine). 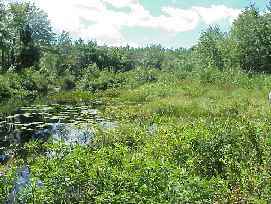 Other fens found in Maine include tall sedge fens, tall shrub fens, low sedge fens, sedge-heath fens, sweetgale fens, circumneutral fens, red maple fens, and open cedar fens. Bogs are permanently saturated, nutrient-poor peatlands dominated by heath or ericaeous shrubs (shrub bogs) and/or evergreen trees (forested bogs) growing in peat moss. They may on rare occasions be inundated. They are found in isolated depressions (kettles) and sometimes extend up adjacent slopes (called slope bogs). They also occur behind narrow fens along rivers, streams, and lakes. A less common type of bog called “Patterned Peatlands” is characterized by the ridges (strings) and depressions (flarks) that extend perpendicular to the flow of water. Characteristic shrub bog species include leatherleaf, sheep laurel, bog laurel, bog rosemary, labrador tea, sweet gale, mountain holly, rhodora, black huckleberry, dwarf huckleberry, cranberries, and black chokeberry. Along the coast in Downeast Maine, black crowberry and cloudberry may be locally dominant with tufted bulrush. Bog herbs include pitcher-plant, grass pink, rose pogonia, dragon's mouth, white-fringed orchid, sundews, cotton-grasses, white beak-rush, and bog goldenrod. Forested bogs may have black spruce, balsam fir, and larch as dominants. Associated species include sheep laurel, labrador tea, rhodora, and creeping snowberry. Edges of bogs where minerals are more abundant and water forms a type of moat are called "laggs." They are colonized by speckled alder and the trees listed above plus northern white cedar, northern wild raisin, blue flag, wild calla, and cinnamon fern. They also provide habitat for lots of animal species, like moose, deer, lynx, cranes, the sora rail, the great gray owl, and many kinds of dragonflies. Some bogs support less common species that are dependent on certain plants within a bog, like the Crowberry Blue Butterfly that uses black crowberry plants as its larval host plant (found in both maritime bogs and coastal sedge bogs). 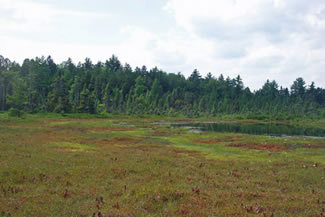 Other types of bogs in Maine include subalpine hanging bogs, mossy bog mats, maritime slope bogs, maritime huckleberry bogs, leatherleaf bogs, dwarf shrub bogs, coastal sedge bogs, alpine bogs, pitch pine bogs, black spruce bogs, and Atlantic white cedar bogs. Shrub swamps are dominated by woody vegetation less than 20 feet tall. They are seasonally flooded and often saturated near the surface when not flooded. Common species include buttonbush, broad-leaved meadowsweet, steeplebush, speckled alder, sweet gale, mountain holly, northern arrowhead, maleberry, red osier dogwood, silky dogwood, highbush blueberry, willows, and common winterberry. Herbs include skunk cabbage, false hellebore, flat-topped aster, New York aster, marsh fern, cinnamon fern, and sensitive fern. Some shrub swamps are dominated by saplings of trees such as red maple, black gum, and larch. Beaver and yellow warblers are found in shrub swamps as well as the American woodcock, a stubby woodland bird that feeds on earthworms. 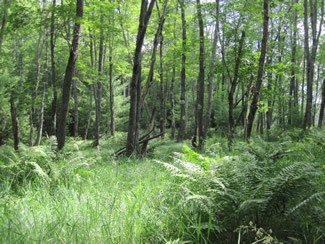 Other types of shrub swamps in Maine include alder thickets, alder floodplains, and grassy shrub marshes. Vernal pools or "spring pools" are shallow depressions that usually contain water for only part of the year. 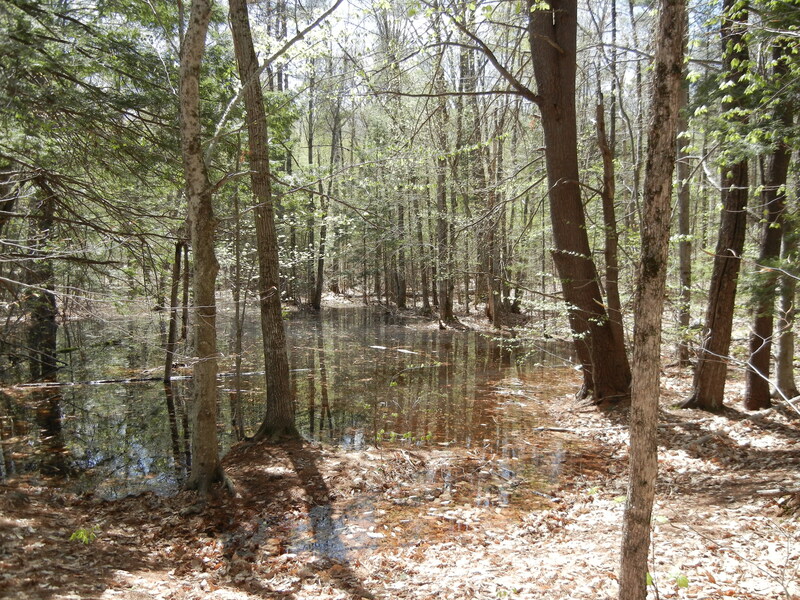 In the Northeast, vernal pools may fill during the fall and winter as the water table rises. Rain and melting snow also contribute water during the spring. Vernal pools typically dry out by mid to late summer. Although vernal pools may only contain water for a relatively short period of time, they serve as essential breeding habitat for certain species of wildlife, including salamanders and frogs. Since vernal pools dry out on a regular basis, they cannot support permanent populations of fish. The absence of fish provides an important ecological advantage for species that have adapted to vernal pools, because their eggs and young are safe from predation. Species that must have access to vernal pools in order to survive and reproduce are known as "obligate" vernal pool species. In Maine, obligate vernal pool species include wood frogs, spotted and blue-spotted salamanders (two types of mole salamanders) and fairy shrimp. While wood frogs and mole salamanders live most of their lives in uplands, they must return to vernal pools to mate and lay their eggs. The eggs and young of these amphibians develop in the pools until they are mature enough to migrate to adjacent uplands. Fairy shrimp are small crustaceans which spend their entire life cycle in vernal pools, and have adapted to constantly changing environmental conditions. Fairy shrimp egg cases remain on the pool bottom even after all water has disappeared. The eggs can survive long periods of drying and freezing, but will hatch in late winter or early spring when water returns to the pool. Many ponds, lakes, and slow-flowing rivers have aquatic beds in shallow water. 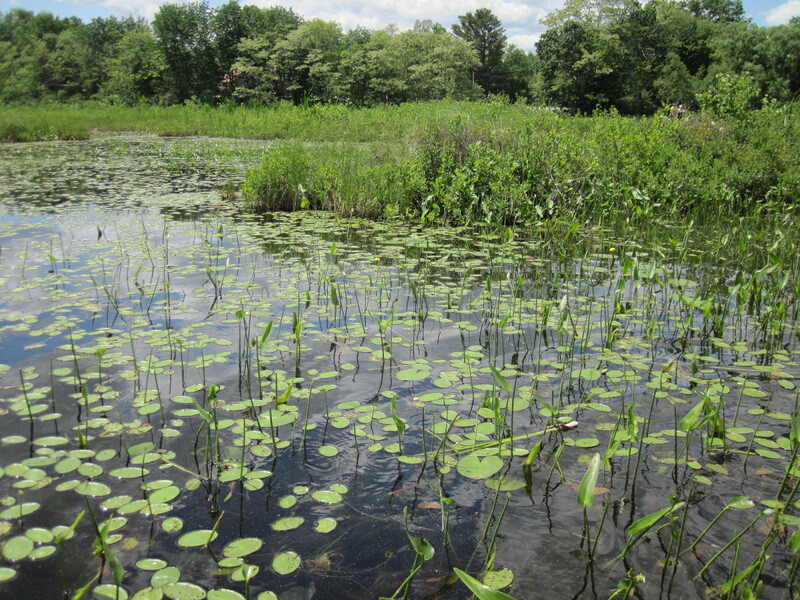 Common floating-leaved and free-floating plants include white water lily, spatterdock (yellow pond lily), watershield, pondweeds, and duckweeds. Submerged aquatic beds include wild celery (tape-grass) naiads, and submergent forms of bur-reeds, pondweeds, pipeworts (in acidic streams), and arrowheads. These aquatic habitats support a range of damselflies and dragonflies, as well as many kinds of waterfowl including less common species like the American coot or Common moorhen. Other animals that are found include reptiles like the northern water snake and common snapping turtle, muskrats, and moose who graze on the emergent vegetation present in some of these habitats. 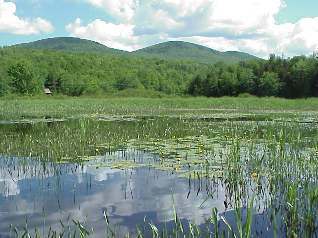 Types that occur in Maine include sandy lake-bottoms, pickerelweed marshes, open-water marshes, and circumneutral ponds.